Format: DVD plus CD-ROM containing a manual, handouts, and Powerpoints. On average, 32 people in the United States die every day in motor vehicle crashes that involve an alcohol-impaired driver. This amounts to one death every 45 minutes. The annual cost of alcohol-related crashes totals more than $51 billion (statistics from the U.S. Centers for Disease Control and Prevention). With education for first-time offenders, coupled with sanctions for repeat offenders and treatment for those who are chemically dependent, these numbers may be dramatically reduced. 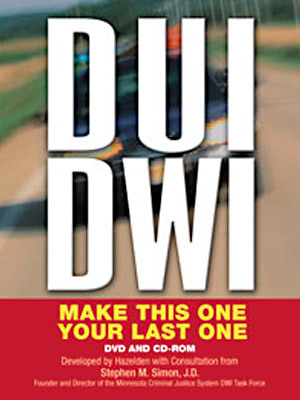 Developed with consultation from Stephen M. Simon, J.D., Founder and Director of the Minnesota Criminal Justice System DWI Task Force, this popular DVD, designed specifically for first-time DUI/DWI offenders, has been expanded into a brief but powerful curriculum. DUI/DWI: Make This One Your Last One now includes a CD-ROM containing a printable facilitator’s guide, presentation materials, and reproducible client handouts that enhance the educational impact of the powerful video. The new print component features the most current statistics and the latest information about drinking and driving under the influence. Ideal for first-time adult DUI/DWI offenders, this program provides compelling content and no-nonsense information in a way that offers an alternative to the ineffective stereotypical scare tactic programs that are often used.